Myles Boisen is a guitarist, composer, improvisor, and record producer/engineer, best known around the Bay Area for his twin-necked twanging in The Splatter Trio, as well as musical exploits with The Club Foot Orchestra. 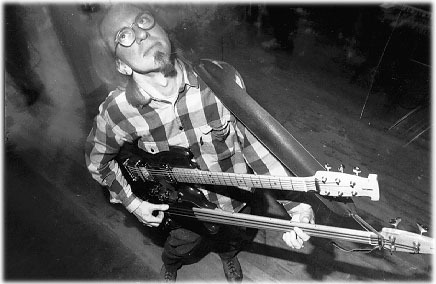 Over the past two decades Myles has performed with John Zorn, Rova Saxophone Quartet, John Tchicai, Nina Hagen, Eugene Chadbourne, Vinny Golia, Myra Melford, Glenn Spearman, Ralph Carney,Miya Masaoka, Malcolm Mooney, Eddie Marshall, and his own "Guitarspeak" ensembles. In collaboration with guitarists Fred Frith, Henry Kaiser, Elliott Sharp, Robert Fripp, and others, he has developed a potent musical language that combines a wealth of traditional and contemporary styles, focusing particularly on prepared guitar technique and improvisation. Myles' discography numbers over 40 compact disc recordings, including his Guitarspeak disc, ten CDs with The Splatter Trio, and musical work for MTV, film director David Lynch, and CBS. As a recording engineer, Myles has gathered over 150 production and mastering credits on recordings by other artists, dating back to 1979 when he began teaching in one of the country's first university-level recording studio programs. He is regarded as an authority on vintage mics and microphone testing, with numerous articles published in Electronic Musician magazine and Mix Books publications. Born October 19, 1956 in Omaha, Nebraska. Granted B.A. degree from Fairhaven College, Western Washington State College (Bellingham, Washington) in 1979, for independent study major in Contemporary Art and Media Studies. Presently employed as freelance musician, and owner/ head engineer of Guerrilla Recording studio and Headless Buddha Mastering Lab, Oakland, CA. Comments or questions about the web site? | Questions for Gino?